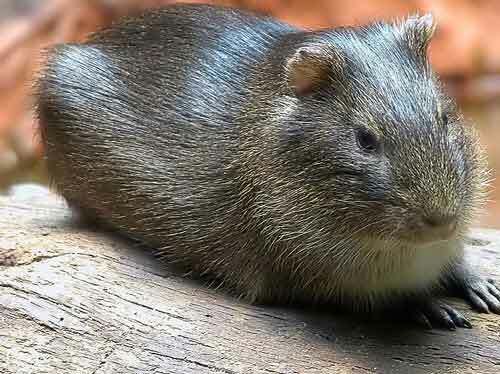 The Brazilian Guinea Pig (Cavia aperea) (preá in Portuguese) is a guinea pig species from South America. It is found in Argentina, Brazil, Colombia, Ecuador, Paraguay and Uruguay. Cavia aperea has been successfully mated to the domestic guinea pig, Cavia porcellus, though many females become infertile in successive generations. The beast is strong in them. 1. ^ Dunnum, J., Zeballos, H., Vargas, J., Bernal, N., Brito, D., Queirolo, D., Pardinas, U. & D'Elia, G. (2008). Cavia aperea. In: IUCN 2008. IUCN Red List of Threatened Species. Downloaded on 5 January 2009.